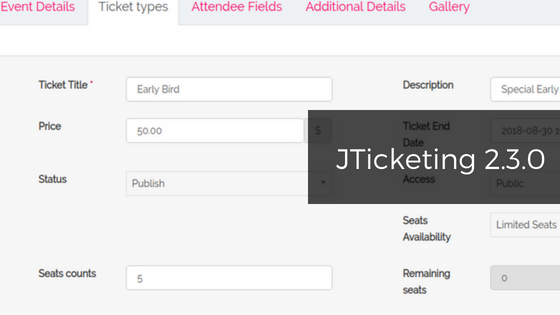 JTicketing 2.3.0 brings "Early Bird" tickets, tag support, quicker event creation and much more! We are super excited to release the much-awaited JTicketing 2.3.0 which brings “Early Bird” facility for events that enable event owners to decide ticket pricing for a specific date range. Besides this, we have added a feature to restrict buyer to purchase a single ticket for the event that is vital for classroom training. A special emphasis has been given on the SEO aspect for the events with the introduction of meta description and meta keywords for the events. Buy JTicketing Now! View JTicketing Demo! We have introduced “Early Bird’ tickets with JTicketing 2.3.0. Similar to flight tickets, site admin can decide the date range for “early bird” in which tickets for events up to a specific date range will be cheaper and after that, the tickets would be priced normally or they will be more expensive than the normal price. Thus, event owners can selectively price their tickets according to a specific date range if they want to provide tickets at discounted rates to a few exclusive buyers. Every event ticket type will have a start date and end date for restricting the ticket booking validity. With JTicketing 2.3.0, we have added Joomla tag support for events. Site owners have been given a fantastic way to organize the events on their website. We have revamped the create event view to make it more user-friendly. All the mandatory fields are now displayed in the first tab. Once you fill in the event start date, the end date, and booking dates will be pre-filled and you only need to change them if you need to. In the earlier versions the ability to configure Vendor specific parameters for Payment gateways for limited to paypal and was hardcoded. With this new update, we have opened up TJ Vendors to be able to configure any supported payment gateway on a vendor level. While functionally we only support Paypal (For pass through payments without any platform fees) and Paypal Adaptive right now, it opens up future possibilities. This feature allows you to restrict the number of seats to 1 ticket per user. This feature is vital for classroom training as user needs a simplified checkout flow to register for the event. After purchasing the ticket, the user will be able to view his ticket on the event details page. Event attendees can get a clear idea of the total number of available registrations for the event before proceeding with the checkout. Note that this feature won’t apply to guest users who buy tickets. All the order status changes will now follow a defined workflow where order statuses can only be changed in a logical order. For example, a pending order would only get confirmed or canceled. A completed order won’t go in pending state. JTicketing 2.2.0 - What to expect?